In 2010 metal detectorists found a copper Roman cavalry helmet which sold at Christies for £2.3 million and the country’s attention turned to this small village. 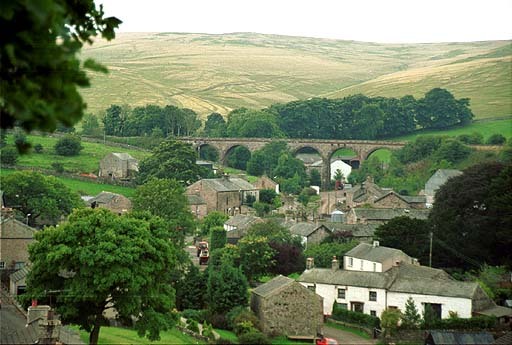 This is quite a large village by our standards, very pretty and about four miles out of Kirkby Stephen. To one side is a high viaduct that takes the Settle to Carlisle railway through the disused Crosby Garrett station with the fell behind. On a hill at the other end of the village is the church of St Andrew. With Anglo-Saxon origins this primarily Norman church has later additions and is worth a visit. There is a Methodist Chapel built in 1882 which united with the Baptists when their chapel closed in 1992. A village hall holds regular community events. The village has hardly changed in centuries and a stroll to see the vernacular architecture in this pretty setting is very pleasant.